﻿ Using Stones for Personal Growth. Carnelian: Sharing. Carnelian is a type of chalcedony (micro-crystalline quartz agate) that has a reddish color imparted by iron oxides. It is often mined in India, Brazil and Uruguay. It usually forms as a vitreous, translucent agate, and can range in color from red-orange to red-brown to sienna or rust. The name comes from the Latin word carne, meaning "flesh". Because it has been found in a number of tombs in Egypt, carnelian is assumed to have been highly honored among the Egyptian people. 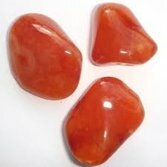 Carnelian acts on the Inner Being to strengthen Sharing. This is sharing your energy with others for a common purpose or goal. It is contributing your energy by working together with someone, or with a group, toward a common end or purpose. The purpose is usually to accomplish something, but not necessarily something physical. It can be to make or build something, to teach, to share ideas, to produce personal growth, or just to produce a positive experience for someone. Sharing is always mutually beneficial for the people involved in the sharing. If it is not mutually beneficial, it is not true sharing. If you are good at sharing, you are a "people person". You enjoy being around people. You learn from people and people learn from you. You like to share knowledge, and you enjoy networking and bringing people's energy together. You also like working with others in order to accomplish things. You accomplish goals easily because you know who to seek out to combine your energy with in order to achieve those goals. Sharing is more than just teamwork. It is always something you choose to do, rather than something you have to do. If you wind up on a team, you have to work with the people on that team, whether you like it or not. But whenever you share of your energy, you do it by choice rather than because you have to do it. Sharing has both a doing side and a knowing side. The doing side is combining your energy with another person to share of yourself, to share your ideas and knowledge with him. The knowing side is knowing what is mutually beneficial. It is recognizing when there is reason to share, when to combine your energies to do something together. These two aspects of sharing work together as two sides of the same duality. This means that as you develop the ability to recognize when something is mutually beneficial for both of you, you also increase the ability to share in general. If you have trouble with sharing, you are not a team player. You don't extend yourself to others, and you don't accept others when they extend themselves to you. You tend to be like the professor working all by himself in his laboratory, not wanting help from anyone, and not wanting to share what he is doing with anyone. By operating in this way, he never has an opportunity to expand his energy through the energy of others, and it keeps him from feeling the joy that results from this type of togetherness. If you operate like this, you often feel lonely and isolated, almost grieving, as if you were in mourning. When people mourn the loss of a loved one, they are really mourning the fact that they can't share their energy with this person anymore. To expand your ability to share, become involved only in stable relationships where you can truly feel safe. Stay far away from controlling and crippling "codependent" relationships, in which both people feed on each other's shortcomings. Feeling safe in a relationship comes from knowing you are compatible to the extent that the other person would not knowingly do anything to harm the relationship in any way. You need to know you are safe with someone before you can share your energy and have a relationship that is mutually beneficial. Supportiveness is also a key to sharing. Try supporting someone close to you by sharing your energy input and taking on a project together. Give the project all the emotional support you can, as well as the physical support it needs to complete it. Being supportive is good practice in sharing because you not only share in doing the project, but you also share in the feeling of accomplishment and mutual benefit you both feel when it is finished. Part of the ability to share comes from a desire to be helpful. To practice this, tune in to someone you care about and put some energy into becoming more aware of what he genuinely needs in life. Learn to be sympathetic to his real needs, especially in times of difficulty, and offer to share your energy when he needs it. And be strong enough to ask for his help when you need it. Developing a mutual desire to help each other will greatly strengthen your ability to share. Another key to sharing is learning to share only when you feel it can do some good. There is wisdom in sharing in a way that doesn't waste your energy.